3. No falling head over heals for someone right away. Remember, love does not exist here. 4. You may carry a weapon for survival and to defeat monsters. 5. This is a romance rp, but keep all romance PG. No explicit stuff. Kissing, hugging, and holding hands are OK.
7. You may interact with the other "couples." 8. Remember, stay with your "significant other" at all times. Being too far away from each other will cause you both severe pain. Your limit between each other is a mile. 9. You are aloud to fall very ill/become near fatally injured. 10. You are mentally connected to your partner. Meaning no matter what other feelings you may have for someone else, they are your first priority. You will feel a strong sense of duty towards them no matter what. 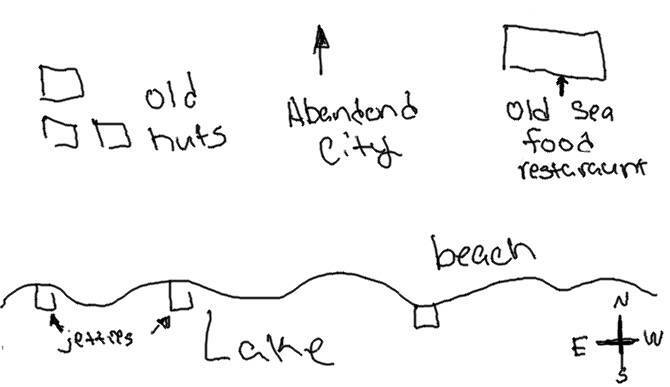 Note: These Maps are rather vague and only show important landmarks. The locations are much more vast then what they appear. Description: The center of Loveless and your safe haven. There are hardly any monsters here (though they wander in from time-to-time) and there are limited supplies. This City is rather dark and gloomy with toppled down rotting buildings everywhere and hardly any plant life. Abandoned Homes (Amore Town): These are the home you and your partner wake up in. The Abandoned homes are actually adjacent to Abandoned City making them more of a suburb. Hospital: A large half-collapsed building. There's hardly much left in it except for a few medical supplies. Town Hall- Probably the only building that's still well-furnished and in semi-good condition. It's booby-trapped, though. Description: This perhaps is one of the calmest locations in Loveless. A cool light breeze always blows through and there are plenty of fish in the lake. However, the lake water is not drinkable. Old Huts: These are old rotting huts on the beach. Despite their condition, they're still very useful for living in. Sea Food Restaurant: A restaurant that's long since been out of business. However, it is still insulated with some old cookware and a gas stove. 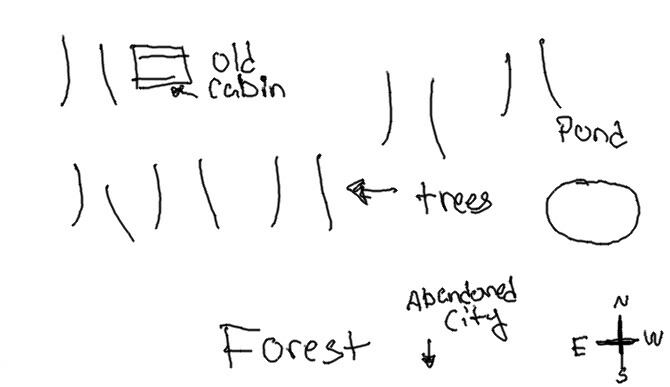 Description: The Forest is probably the second most dangerous place in Loveless (there are monster roaming around). However, it is heavily covered with tall, thick trees. Making it easy to be elusive--especially at night. Despite it being a forest, there are little to no animals. Cabin: Like the Town Hall, it is still in pretty good condition and pretty well insulated. Pond: An ever-flowing small body of water. It is also the closest clean source of water in the Loveless region, so you'll have to go here to get clean water. Description: The most beautiful but dangerous location in Loveless. There are monsters here, so be careful! It is also probably the biggest part of Loveless; it stretches for miles. Caves: A series of small connected caves at the end of The Outlands. There are pools of cool, drinkable water inside these caves as well as diamonds in the walls and ceilings, giving it a starry-like look inside. These diamonds glow in the dark and there are many of them so torches are not usually necessary except for some of the areas where they are not located. 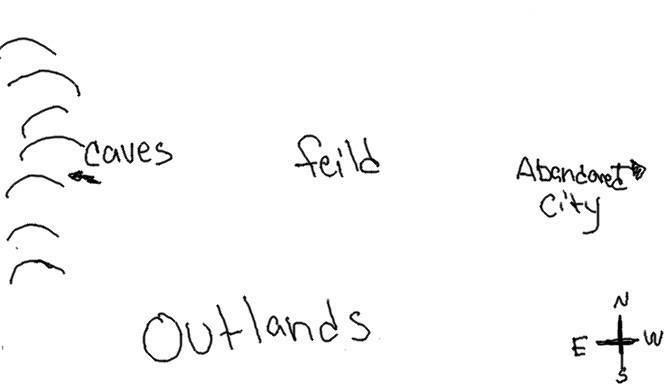 Fields: These a very, very wide open fields and make up the majority of The Outlands. There is literally nothing for miles. These fields also appear to be somewhat bipolar as in some areas there are flowers, others just grass, and some areas just totally barren. REMEMBER: Loveless is a post-apocalyptic-like world. That means most civilization is in ruins and there are very few well-insulated places. I remember everything being calm. The air was cool and a soft light peaked through the closed curtains above the bed, and all was quiet. I felt someone's soft breath on the back of my neck and their warm body near mine. I probably could have stayed like that forever. In an endless, peaceful sleep. But my body was not so kind as to let my sleep for long. My eyes flashed open and in the next moment I found myself in an unfamiliar room. I tried lifting my head to get a better look and found my neck to be soar. I tried moving my arms and legs and found them to be heavy as well. My head collapsed back onto the pillow and a soft groan escaped my lips. I tried again, this time propping myself up on my elbows and looking around. This was not my room. None of it even looked vaugley familiar. Come to think of it, neither did anything else. I couldn't remember. Not who I was or where I came from. What was my name again? I looked down at myself and found I was wearing a long silk light blue gown. I didn't remember putting this on. My eyes followed the room around until it came across an old vanity with two sets of clothes folded and stacked neatly on the bench. Two? I glanced over beside me and noticed for the first time that there was a man i did not recognize sleep by my side. I found my lungs right then and there. I let out a shrill scream and shoved him off the bed. If I wasn't fully awake before, I was now. Pierre woke up feeling very groggy. He opened his sapphire blue eyes which were filled with the sandman's magic sleep powder, making them stick halfway. Irritated at this, he raised one hand - and found that he was very sore. His arms ached as though he'd drawn a thousand pictures, which he assumed, he hadn't done. Another thing was that his sketch book was no longer there. He pushed himself from the bed, bones creaking as he did so. "Heh. Well, that was round one." he joked, then seeing himself in a room that was very different than his own. There was red wallpaper where his had been blue - though the wallpaper here was fading and even chipped in places. He looked around the room and discovered that he wasn't alone - there, a few feet from him, was probably one of the cutest girls he'd ever seen. White hair, like his, and pale blue eyes like nothing he'd ever seen. They reminded him of the Swiss Alps. Then he realized that he was wearing different clothes. Blue short sleeved pajamas. Since when did that happen? Across the room was a vanity with two pairs of clothes. He took the boy-looking clothes and looked around for a bathroom to change in. "Bingo." he said, quickly closing the door behind him and proceeded to change, taking off the pajama pants and slipping on a comfortable pair of slacks in just about his size. The band was just a smidgen too loose, but he liked it that way. He slipped the night shirt off, and put it and the night pants in a nearby hamper before sliding on his button up shirt, slowly doing the buttons - in white. He didn't know how he'd gotten here, or what he was supposed to do now, but he thought that whoever had did this to him had good taste in clothes. The last place I remembered I was in was my room in my house. But somehow when I woke up I was dead tired. My right leg just felt sore I didn't feel like moving at all. The bed was comfy. But there was a warm presense beside me. Maybe it was just me? I opened my eyes and I dont know if it was just me but I could of sworn I saw blonde hair. "For the love of god please don't tell me I got drunk and...." I thought to myself worrying if I did something. I never drank but still. The blonde had trouble getting up and when she did she let out a heck of a scream. This caught me by surprise. I shot up from the bed and stared at her in horror. "Who are you? And what are you doing here?" I asked pretty scared for myself also. I looked around to find this room unfamiliar. She shoved me off causing me to fall on the floor. "I swear I didn't do anything!" I exclaimed in self defense. Okay I still had my clothes on and that was a good sign. I did a little sigh of relief but this girl was freaked out, even I was freaked out. Heck, nothing looked familiar in this room. The bright morning light stung Dwight's eyes as he woke up. He felt horrible. There was an uneasiness to his stomach and his head was throbbing. Every time he hung out with friends this happened. To his surprise he wasn't in his own room though, some shabby motel by the looks of it. Picking up his glasses, he saw that he was correct. This place was a dump. Getting off the bed he was in he let out a big yawn. Just perfect. He was in his boxers and some poor girl with short blonde hair was sleeping next to where he was. Making a silent cross across his torso he hoped that they didn't end up doing anything too bad. Last night he was really drunk after all. Stepping into his pants that were on the floor, he pulled them up and tied the ends. He'd try to ditch the girl before she came to. That way he'd not have be responsible if anything did happen between the two of them. The violent urge to chunder stopped him cold in his thoughts. This was nothing like a hangover barf though, it was like he was literally being ripped apart. When he was thrashing about he noticed that the closer he got to where he woke up the spasms stopped. Following the trail he came from his symptoms stopped once he got to the door he exited. What in the world was going on here? It was like a bad video game. Many things were bothering him. He swore he didn't drink too much last night, but here he was struggling to remember his parents' faces. I don't remember what happened. I just remember waking up there, i felt sick to my stomach, tossing and turning. I reached my hand out to touch the wall, and instead i felt flesh. I immidatly turned to the source of the feeling to see a boy in bed next to me. I shrieked in suprise falling off the bed. "where am i?" i whispered quietly before suddenly feeling my stomach clench and i had to lean over. "great, i'm sick, i have no clue where i am, and there is a strange boy in my bed," I sighed wiping my mouth of the grime and shaking his shoulder. I tried not to move. It hurt too much. It is odd, her bed never gave her pain. The king size bed was the confiest, and most luxurious on Earth. Fluttering open my heavy eyes, I notice that this isn't my room. Vaguely, I remember a canopy over my bed. Bed... There was none. I slept on the floor! What happened last night? Or any night, really. Was I a party girl? Or kidnapped? I can't remember much. Name? Evangeline Mudd. Age?16. Rich? Was I? I remembered my room, the butler, the doting and spoiling. I assume I was filthy rich. I sit up and everything starts hurting at once. I don't know what to confort, so I massage my throbbing hair. Ugh... Maybe I'm having a hangover? That would explain a lot. Do I drink? If so, I'm the rich party girl. I dread if that were true. But here I am, in a strange place, in my night gown, in a groggy pain. I must have been at a party. I look down and my eyes see lo and behold. A blurry fish tattoo. Did I always have that? And why was everything so blurry? Was it just because of my rotten sick feeling, or because I'm blind as a bat? Suddenly I hear rustling. What was that? I try to make everything out, but it is too fuzzy. Although I do make out that I'm not alone in here. Oh, Evangeline! What did you do? "Do you remember how I got here?" she asked the person. I found myself pressing my back up against the corner of the room. I thought maybe something had happend but....this man seemd as confused as I did! "I-I should be the one asking that question." I manged to stutter out. I scanned the room for anything I could use as a weapon in case this man was dangerous. There was a rotting plant of wood in the corner. Good, that would work. "N-now I don't know who you are." I started to inch towards the plank of wood. "Or how I got here. But I am NOT afraid of you. So if you try anything funny..." I suddenly sprang forward and grabbed the plank. "I'll--I'll use this!" At first I didn't know what she was going for until I saw a wooden plank. She isn't going to hit me isn't she? Wait so she didn't know how she got here and she thinks I'm going to hurt her? Well I didn't know this woman and I didn't know if she was a friend or foe but I did not want to hurt her. That would lead to problems in the future. I was silent when she was talking but as soon as she aimed to wooden plank at me, I got up and raised my hands defensively. "Woah woah! Look, I'm sure we can work this out," I started, "I too went to sleep in my own house and in my own room and I don't know how I got here. Next thing I know I just woke up here in this room. I don't know I might of sleeped walked or something but look we can work this out, okay?" I explained trying to clear things out. I was hoping she would understand and that we could get things out of the way. I didn't know what happened yesterday except for me falling asleep. Heck I couldn't picture my own parents. Or their names. I only knew my name and how I failed to become a marine. "I have no intentions of hurting you. So if you could gently put that wood plank down, that would be much appreciated," I added after a few moments. To be honest, I was freaked out. I mean its just a wood plank but she could have a wicked strength leaving me unconcious and then she would kill me. That even made me more frightened. Plus I was still sore all over my body and I looked down at my wrist. ......A bracelet? Did I even wear jewelry? No I'm a man! I shouldn't wear girly things! So I tried to take it off but it was literally planted into my skin. Shoot. Now people are going to look at me funny. The plank of wood slipped out of my hand and clattered on the floor and I slowly stood up straight. "I'm Berenice." I said. Berenice? Was that my name? Yeah, that sounded right. But what was my last name? Maybe that part would come later. "May I ask your name, sir?" I asked. I took a step towards him. Now my body was moving on its own. It was like I couldn't stay away from this man even if I wanted to. This.....this...."Instinct" was definitely a powerful thing. Pierre came out of the bathroom, dressed in a new pair of clothes when the girl rose from the floor, almost fully awake. He shook his head. "I'm not sure how even I got here. All I can remember is studying for the test on Trigonomitry." he added, blinking at her. "In case you were wondering, you have some clothes too, on the vanity." he said, nodding his head to the old rickety vanity they had to share. Not that Pierre ever intended to use it. He was quite fine with a comb, which he always carried around in his back pocket. Thinking about that, he walked over to the vanity and looked at himself in the mirror. "Geez, I figured from sleeping on the floor it'd be a wreck." he added. His hair really was a mess, spread out in every direction. He went back to the bathroom to come out a moment later with a comb cleaned of his hair (fortunately, he'd found a small trashcan) and his hair much more tidyer. "I'll set it here for if you want it. It's clean, I just cleaned it." he added, putting it on the night stand by her clothes. "My name is Pierre, Pierre Black." he said, introducing himself as he turned back towards her, leaning on the vanity. Thank goodness she believed me. I thought it wasn't going to be easy but atleast she dropped the plank which gave an uncomfortable sound to my ears. She introduced herself and said her name was Berenice. It was a nice name to suit her, she did look like a Berenice. In my point of view at least. My name? I can't really figure out my last name but I do know my first one. "I'm Damian. Nice to meet you, Berenice," I said holding out a hand and making a friendly gesture. she walked closer to me and I was beginning to think that she might pull one trick on me. Like she was lying that she believed me? I don't know. For now she was going to be my 'friend' Although I can't officially pronounce us friends right now. Like an aquaintance. You know them but you just can't consider them 'friends' just yet. I shifted my eyes around this room. It look kind of nice but a little unsafe to me. "Do you know where we are by any chance?" I asked seeing if she knew. I took his hand and smiled warmly. "Nice to meet you." I said. "No, I'm afraid I don't. In fact, I'm afraid I don't remember anything." I glanced over to the vanity with the clothes neatly folded on them. "Those clothes look familiar to me, though. Perhaps they'll reveal something?" I let go of Damion's hand. And when I did, a strange orange light came out from under my sleeve. I gasped and pulled my sleeve up. A bracelet? I didn't remember a bracelet at all. It was a lovely baby blue color with seven odd-shaped holes in it. The first hole had an orange gem inside. I tried pulling it off, but when I did my skin was tugged with it. I WINSTON PAYNE winced in pain. "I guess that's not coming off anytime soon." I grumbled. I let out a big snore and then rolled out of bed. There was nothing strange there. That's how I woke up every morning. Nope. What was strange was the fact that I was in a different bed with a girl in the room. Talk about a wake up call. Funny, when I felt someone shaking me I thought it was my mother. Guess not. Hmm. I stood up and walked to the girl. She was on the floor and didn't look so well. "Hey, you OK?" I asked. Normally, I'd be very very freaked out. But I figured it was some sort of prank. Still, this girl really did look ill.
Maria stood up and backed up against the wall. "who who are you, i wasn't drinking, and i wasn't at a party last night, and...where is this place anyways!?" she asked her entire small frame shaking looking like a lost child. She looked down to avoid his gaze and caught notice of a wrist band. "what is this?" she thought noticing it was melted into her skin. She nicely returned the hand shake. I guess she was nice. I saw a strange baby blue light come from my bracelet. What? That's just weird. Berenice also struggled to take the thing off. Great we didn't know where we were and we both had bracelets that were literally attatched to our skin. Her's showed an orange light while mine showed a baby blue light. Wierd. Berenice suggested we change into the clothes near the vanity. I didn't believe clothes would reveal something but it was worth a try. When I took a closer look the clothing that looked like it would fit me looked famliar also. Thank you! Something familiar in this room! I took 'my' clothes and then turned to the girl. "I'm going to go in a different room, if there's any, to change. I'll be right back,"I said opening the door. The building was small but it was kind of comfy. But also had a hint of danger. I dont know, it's just me. I slipped into my clothes until something caught my eye. On my right foreleg....was a tattoo? Did I get a tattoo yesterday? Shoot! My life is now jacked up. It looked like a jaguar? Believe me they were cool animals but Im not obssesed with them. In the mean time, I looked around this building. It will do as a house for now. 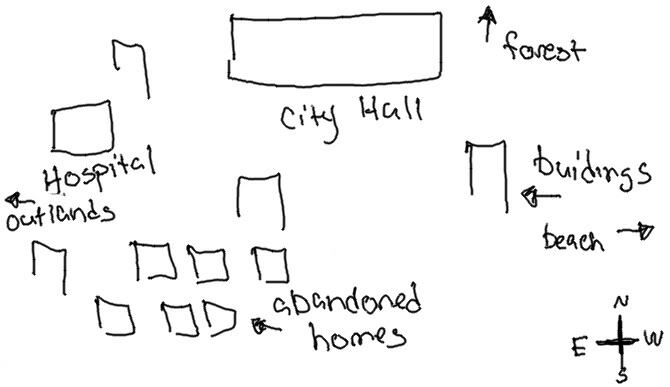 Maybe after Berenice gets changed we should go look around this place for food and water. You know, something to eat. I nodded. "I'll get changed in here, then." I said. After Damion left, I slipped off my clothes and started to get changed into these ones that were supposedly mine. It was a rather strange wardrobe, to be honest. An outfit you might see a maid wearing or something. Possibly a school uniform from a REALLY prestigious school or something you'd see in a manga. I slipped on the petticoat and the blue skirt and tugged the white knee-high socks up my leg. As I went two pick up my blouse two things happened: one, I noticed something gold and shiny underneath. I moved the blouse and found a long gold chain--long enough to fit around one's waist--with an old-time pocket watch attached to it. I picked it up and rubbed my fingers across it. It was heavy and had small numbers engraved in the back. That meant it was real gold. Maybe it revealed something about me? I tried opening it, but I found it to be stuck. I let out a sighed and hooked to gold chain and watch around my waist. The next thing I discovered was a bit more alarming. As I was getting ready to put my blouse on, I caught a glimpse in the vanity of a small black squiggly line on my left shoulder blade. I turned my back more towards the mirror and craned my neck. I gaped at what I saw. There was a tattoo of a long black snake on my shoulder blade! Now I was definitely sure I wasn't the type of person to get a tattoo, so what was it doing there? A felt a shiver run down my spine and I slipped on my blouse and vest. Then I tied two blue ribbons into my hair and slipped on my shoes. After that, I set off to find Damion. Maybe he had found something out? "Whoa whoa whoa!" I said shaking my head and throwing my hands up defensively. "I'm not going to hurt you and I have no idea how we got here. But you look seriously ill so...." My voice trailed off when I noticed the girl was messing with something on her wrist. Suddenly, I felt compelled to check my own. I pushed my sleeve up and discovered two curious things. One: There was a black bracelet ironed to my skin, and Two: There was a small tattoo of a sword on my hand. Don't remember getting that one. I shook my head. Now was not the time two be contemplating that. I let out a sigh and offered my hand to the girl. "I'm Daisuke." I said smiling. "Daisuke Fujimora." Maria looked at him nervously and noticed his bracelet. She looked from his hand to his face and took a shaky breath. "calm down or you'll start acting up," she told herself out loud softly before taking his hand. "My name is maria, maria rivera santiago," she whispered standing up. "I apologize for the outburst, I wke up in bed with you and i kinda freaked," she said blushing. These clothes looked oddly familiar. Like a nastolgic feeling. I guess it did look like one of those uniforms I used to wear in bootcamp but slightly more causal. Weird. You know what? Everything was weird here! I sighed until I heard a door open. Berenice was probably done. I eventually found her. "I was thinking we should find food or something and also get used to our surroundings," I suggested. Plus I was hungry and I bet she was too. Plus these bracelet things and tattoos gave off something suspicious. I didn't understand any of this. So....I lost my memory and I didn't know where I was? Wonderful. For now Im just going to focus on food right now. I was straightening out my skirt when Damion walked in and suggested we go find food. "Alright, I'm pretty hungry myself." I said. My stomach growled to confirm this. Now there remained but one problem. Well, one we could probably solve, at least. Where could we find food? Surely there was more of this strange place then just a house. "Alight then! I guess we're going exploring!" I said. "I can cook pretty well.....I think. So let's scope out the area until we find something. Maybe we can at least find out where we are." I ran towards the front of the house and exited through the door. I gasped at what I saw. "Whoa, that's some name." I chuckled pulling her up. "Better keep it close, or you might loose it like we did our memories." I meant this as a joke, but it sounded as if it could really happen. "Don't fret over it too much. I can understand that." I glanced over at a bench where two pairs of clothing were neatly folded. "Those yours?" I asked. "no..." she said walking over and examining them. "where did these come from," she wondered before glancing around. "do you want to look around, there might be more than one room, and i'd really appreciate figuring out where we are, even if i suspect i won't like the answer," she mumbled, more or less to herself. Oh that's just great. Evangeline was stuck with someone else having a case of amnesia. Just great. She wanted to scream. They probably did something immoral. Or just naughty. And he seemed awfully chipper for a guy who couldn't remember anything but his last maths class. And at least he had that, Evangeline couldn't remember if she took maths. She probably did. All people do, except for those who are in poverty and didn't have time for maths. Motioning over to the clothes, Evangeline gulped. How do you put on clothes again? Did she ever dress herself or did she just forget how to. She ignored it. Her clothes are just fine. Well... not really, but she didn't feel like asking a stranger to help her get dressed into foriegn clothes. Where was she anyway? Was she still in the UK? Or was she in France or anywhere in Europe? She stared outside and it looked like the world died overnight. Maybe she was in a ghost town? Or a town that was in a neuclear distaster. Which was worse? Evangeline didn't know. "My name is Evangeline Mudd. Call me Eva or any nickname and I will hurt you." she said bluntly,"I will not be wearing the clothes provided for me, as mine are just fine. And you will help me get back to my home in London...wherever that is. I can find it." she explained with little confidence in the last part. Did she even live in London? Or did she live in Bath? She wasn't sure. I woke up. Luckily, the man left. I sighed of relief. I stopped. Did he remember to bring his pants with him? I laughed. Too bad. I hopped out of bed, and looked down at my clothes. It was a silky nightgown, the color black, with small white sparkles decorated around it. Was this mine? I couldn't remember, but I defitatly had to change. Eh.. how do you change again? I looked around, found a small wallwith no windows, got my clothes, and tried to change. It didn't work the first few times, but eventully I got it. So that's how you change... I remember how to put my shoes on. I just slipped out of my slippers, and slipped in my black flats. I neatly stored my nightgown and walked out. I had to find out about this place. I had to. Oh wonderful, a girl who thought she owned the world! He chilled at these words, or orders so it sounded like. "Certainly miss Evangeline Mudd - would you like to leave now or stay here a little longer?" he added sarcastically. He already started to detest this bossy girl. "Your pretty arrogant when facing an unknown place with an unknown person, aren't you?" he asked, putting ice in his voice. The girl he had found so pretty that morning turned out to be quite different than her sleeping form. "Suit yourself, though if you want to get to the bottom of things, I would suggest you change." he added before wondering what his first step in this strange place would be. He stroked his chin for a moment, then turned to her. She was the only person nearby that he knew around here, and knew that was here, wherever here was. He might as well stay with her for a while. Berenice agreed with me and I could hear her stomach growl. It was funny but none of the less we headed towards the front door. she said that she was good at cooking. For myself I didn't even knew how to make a sandwhich for my life. Right when we opened the door this place was like an abandoned city. I stood there in shock for a few moments. This place was definetly not 'home' it didn't even have the feel to it. "W-well then, let's see what we got here," I said changing the subject looking both ways to see if any signs of life were here. I could hear a few screams but that was just me. I hope it was not just us here. This place was certainly creepy. I squinted my eyes for some things like green of course. Grass? Trees? Nature? Anything? "Berenice do you see anything? Like besides buildings?" I asked still moving my head around.